November 29, 2016 by David Shields. Average Reading Time: about 8 minutes. 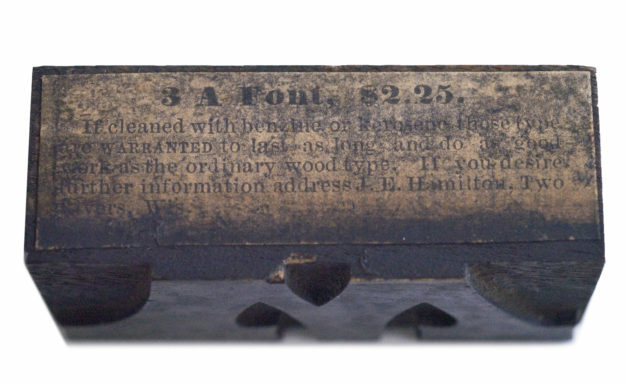 The wood type manufacturing industry that developed in the United States in the late 1820s2 used marks stamped into the type block to identify the original manufacturer of the wood type. The stamped marks are referred to as manufacturer’s stamps (also often informally called “maker’s marks”). 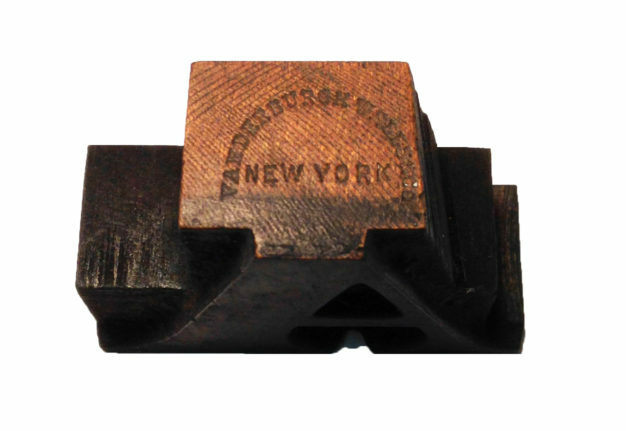 Though not dissimilar to type founders pin marks in function, the manufacturer’s stamps were not a by-product of the manufacturing process, but were intentionally created as a separate step in production by striking a steel punch to the side of the wooden type block to distinguish the manufacturer’s products from those of its competitors. This strike was performed manually after the type block had been finished, as the final step in the manufacturing process. 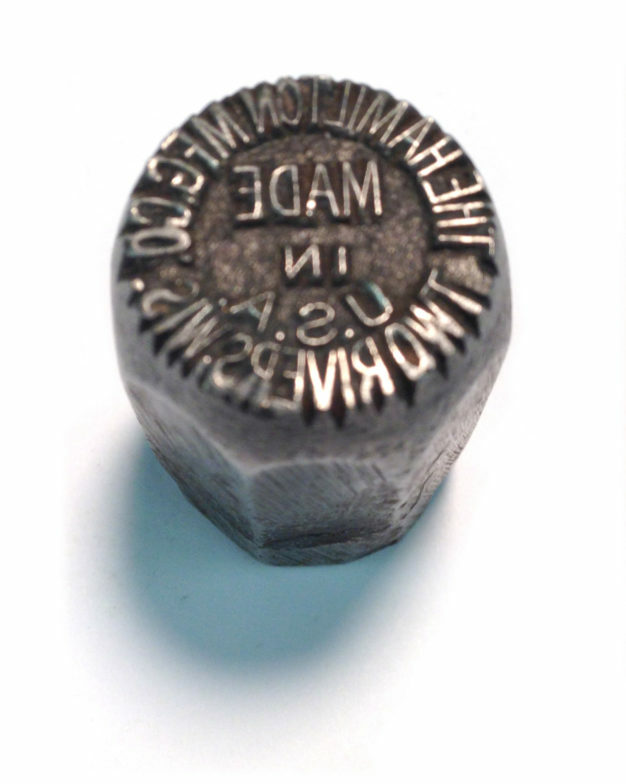 Though no punches used to create the manufacturer’s stamp have yet been found, this steel punch was used by The Hamilton Manufacturing Company to mark printing furniture until 1926. The punch is part of the collection held at The Hamilton Wood Type & Printing Museum, Two Rivers, Wisconsin. 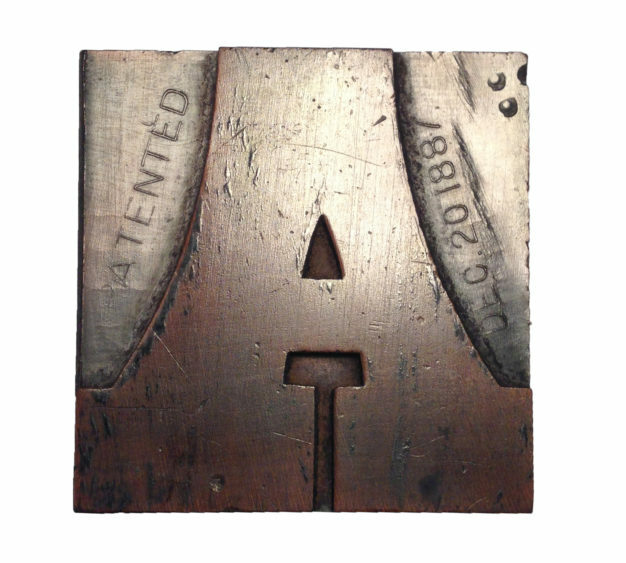 While foundries were able to build their mark into the type mould for each letter, thus marking every piece of type cast, American wood type manufactures would typically only stamp the side of the block of the capital A. There are some early examples of manufacturers stamping the foot of the type block. 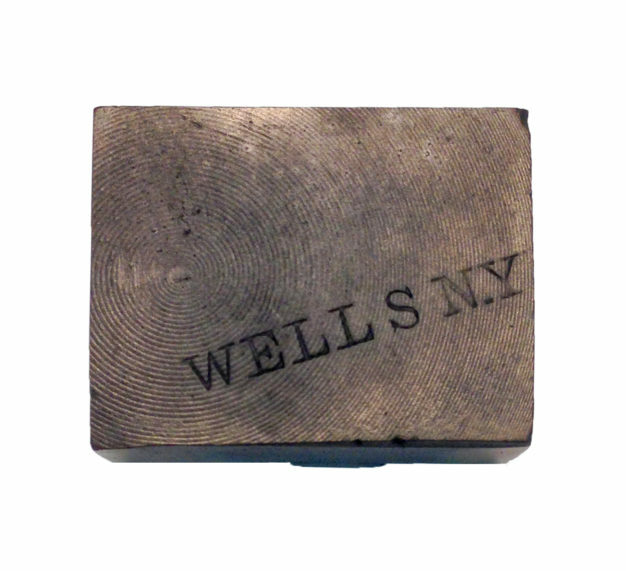 Type manufactured by Wells & Co of New York, and Bill, Stark & Co of Connecticut has been found with stamps on the type block’s foot. Though exceptionally rare, there is also evidence of Wells punching the manufacturer’s stamp into the shoulder of the block. Placement on the foot appears short lived. It is unclear why the stamp location shifted to the side of the block, though one can imagine that there were fewer opportunities to damage the face when striking the side, rather than resting the type face down when striking the foot using a metal punch with any force. Regardless of the reason, by the mid 1850s, the stamp location had most predominantly been shifted to the side of the type block. It is also as yet unclear why only the capital A was stamped. It may have been seen as a labor saving optimization to only stamp the first character in the font. Manufacturer’s stamp located on the foot of the type block. This stamp was used by Darius Wells very like in the early 1830’s, and definitely before 1839. This type is part of the collection held at The Hamilton Wood Type & Printing Museum, Two Rivers, Wisconsin. While many manufacturers made use of a stamp, it was not consistent across all manufacturers. A number of manufacturers applied paper labels to the side of the type block. Unfortunately, this method did not stand the test of time, or the regular wear-and-tear of the printing office, and once removed left no indication of the original manufacturer. A rare example of a paper label affixed to the side of the type block. Rob Roy Kelly dated this to 1881, “the first year Hamilton was in business.” This block is part of the Rob Roy Kelly American Wood Type Collection held at The University of Texas at Austin. One of the 17 styles of type produced using the die-cut method by Page. The stamp indicates the patent date — Dec 20, 1887. This date is connected to 2 (US Design Patent 374,993 & 375,008) of the 6 patents awarded to William Page & George Setchel between 1887 and 1889 for perfecting the die-cut process. 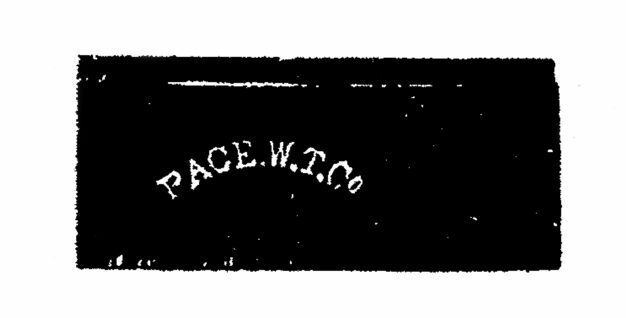 Page used this marking from 1887 when the patents were granted until 1891 when the company was acquired by the Hamilton Mfg Co. The manufacturers stamp served a useful purpose at the time — clearly indicating the original manufacturer would then drive more sales back to the original manufacturer. It also served the function of proving the authenticity of the type. It was not uncommon to try to pass off competitor’s designs as one’s own. Page explained the custom of marking type in the introduction to his Supplementary Specimens of Wood Type, Rules, Borders, etc. of 1859, “…as parties have supposed they were buying our type, and got other manufacturers instead. Be sure to look at the A’s of each font, which are all marked, and any article so stamped will be warranted to give the utmost satisfaction to the purchaser…”. The manufacturer’s stamp also serves a useful purpose today — providing definitive evidence to connect a specific manufacturer to a particular font of type, and reasonably accurate evidence for when the type was made. When type is found with a manufacturer’s stamp, it can reasonably be dated to the period of time the company used that name or address, while Kelly himself pointed out “this system of dating is not entirely reliable”5 it does serve as a reasonable indicator of dates of manufacture. The manufacturer’s stamp provides a name and often a company address. This data can be used to narrow the possible dates of manufacture. Companies would change their stamp when the name of the company or location of their manufacturing facilities changed, which was a common occurrence for wood type manufacturers during the 19th and early 20th centuries. William H Page’s company is a good example. In 1856, Page started his business with James Bassett in South Windham, Connecticut. The company was, not surprisingly, named Page & Bassett6. The following year the company moved to Greenville, the industrial district just outside Norwich, Connecticut. In 1859, Samuel Mowry bought out Bassett’s interest and the name of the company was changed to William H Page & Co. Stamp used by Page 1859–1867. In 1876 Mowry retired and the company changed its name to William H Page Wood Type Co. Each of these changes precipitated an alteration to the configuration of the stamp punched into the side of their capital A. Stamp used by Page 1876–1891. Change of business address would also often trigger a change in the stamp configuration. Vanderburgh, Wells & Co retained the same business name from 1864–1890. Stamp used by Vanderburgh, Wells & Co 1864–1867. The company was located at 16 & 18 Dutch Street and 110 Fulton Street in New York City from 1864–1890, the stamp used indicated this address. In 1867, a fire destroyed the manufacturing warehouse in Patterson, New Jersey necessitating the move of the production facilities to the New York offices. At the time of the expansion, the stamp was changed by removing the address. Stamp used by Vanderburgh, Wells & Co 1867–1890. To date there are seven recorded American wood type manufacturers that used a stamp to mark type in the 19th century. This list includes companies owned by William H Page, Horatio & Jerimiah Bill, JG Cooley, Darius & Heber Wells, Charles Tubbs, William Morgans, and JE Hamilton. The process of stamping the sides of type blocks continued well into the 1920s and 1930s by manufacturers that included ACME Wood Type Mfg Co, Empire Wood Type Co, Hamilton Mfg Co, and American Wood Type Co. It seems the last manufacturer to mark their type this way was Hamilton Mfg Co. Hamilton discontinued the process sometime in the late 1950s, ostensibly due to the reduced need for differentiating their type from that of their competition. In his 1964 folio, Rob Roy Kelly published 15 manufacturer’s stamps and included a explanation of the stamping process. Five years later he would use this explanation to accompany 16 manufacturer’s stamps in his book American Wood Type 1828–1900.7 Robert Long published Wood Type & Printing Collectibles8 in 1980 and showed 11 American manufacturer’s stamps, two of which had not been previously shown by Kelly. To date, 26 stamps and two die-cut impressions, used by American wood type manufacturers have been recorded. It is hoped that more stamps will come to light as more collectors focus on this aspect of their wood type collections.